Johnny Cash (February 26, 1932–September 12, 2003), born J. R. Cash, was an American singer-songwriter and one of the most influential musicians of the 20th century. Primarily a country music artist, his songs and sound spanned many other genres including rockabilly and rock and roll (especially early in his career), as well as blues, folk, and gospel. Cash was known for his deep, distinctive bass-baritone voice, the "chicka-boom" freight train sound of his Tennessee Three backing band, his demeanor, and his dark clothing, which earned him the nickname "The Man in Black". He traditionally started his concerts with the introduction "Hello, I'm Johnny Cash". Much of Cash's music, especially that of his later career, echoed themes of sorrow, moral tribulation and redemption. His signature songs include "I Walk the Line", "Folsom Prison Blues", "Ring of Fire", "Get Rhythm" and "Man in Black". He also recorded humorous songs, such as "One Piece at a Time" and "A Boy Named Sue", a duet with June Carter called "Jackson", as well as railroad songs such as "Hey Porter" and "Rock Island Line." Cash was of Scottish royal descent but he learned this only upon researching his ancestry. After a chance meeting with former Falkland laird, Major Michael Crichton-Stuart, he traced the Cash family tree to 11th century Fife , Scotland . Scotland's Cash Loch bears the name of his family. He had believed in his younger days that he was mainly Irish and partially Native American. Even after learning he was not Native American, Cash's empathy and compassion for Native Americans was unabated. These feelings were expressed in several of his songs, including "Apache Tears" and "The Ballad of Ira Hayes", and on his album, Bitter Tears. Johnny Cash was born J. R. Cash in Kingsland, Arkansas , to Ray (1897-1985) and Carrie (née Rivers) Cash (1904-1991), and raised in Dyess, Arkansas . Cash was given the name "J.R." because his parents could not agree on a name, only on initials. When he enlisted in the United States Air Force, the military would not accept initials as his name, so he adopted John R. Cash as his legal name. In 1955, when signing with Sun Records, he took Johnny Cash as his stage name. His friends and in-laws generally called him John, while his blood relatives usually continued to call him J.R.
Cash was one of seven children: Jack, Joanne Cash Yates, Louise Garrett, Reba Hancock, Roy, and Tommy. His younger brother, Tommy Cash, also became a successful country artist. By the age of five, J.R. was working in the cotton fields, singing along with his family as they worked. The family farm was flooded on at least one occasion, which later inspired him to write the song "Five Feet High and Rising". His family's economic and personal struggles during the Depression inspired many of his songs, especially those about other people facing similar difficulties. Cash was very close to his brother Jack, who was two years older. In 1944, Jack was pulled into a whirling table saw in the mill where he worked, and cut almost in two. He suffered for over a week before he died. Cash often spoke of the horrible guilt he felt over this incident. According to Cash: The Autobiography, his father was away that morning, but he and his mother, and Jack himself, all had premonitions or a sense of foreboding about that day, causing his mother to urge Jack to skip work and go fishing with his brother. Jack insisted on working, as the family needed the money. On his deathbed, Jack said he had visions of heaven and angels. Decades later, Cash spoke of looking forward to meeting his brother in heaven. He wrote that he had seen his brother many times in his dreams, and that Jack always looked two years older than whatever age Cash himself was at that moment. Cash's early memories were dominated by gospel music and radio. Taught by his mother and a childhood friend, Cash began playing guitar and writing songs as a young boy. In high school he sang on a local radio station; decades later he released an album of traditional gospel songs, called My Mother's Hymn Book. He was also significantly influenced by traditional Irish music that he heard performed weekly by Dennis Day on the Jack Benny radio program. Cash enlisted in the United States Air Force. After basic training at Lackland Air Force Base and technical training at Brooks Air Force Base , both in San Antonio , Texas , Cash was assigned to a U.S. Air Force Security Service unit, assigned as a morse code intercept operator for Russian Army transmissions, at Landsberg , Germany . On July 3, 1954, he was honorably discharged as a sergeant. Then, he returned to Texas. On July 18, 1951, while in Air Force training, Cash met 17 year-old Vivian Liberto (April 23, 1934, San Antonio, Texas —May 24, 2005, Ventura, California ) at a roller skating rink in her native San Antonio. They dated for three weeks, until Cash was deployed to Germany for a three year tour. During that time, the couple exchanged hundreds of pages of love letters. On August 7, 1954, one month after his discharge, they were married at St. Anne's Catholic church in San Antonio. They had four daughters: Rosanne (born May 24, 1955), Kathy (born April 16, 1956), Cindy (born July 29, 1958) and Tara (born August 24, 1961). Cash's drug and alcohol abuse, constant touring, and affairs with other women (including future wife June Carter) led Liberto to file for divorce in 1966. In 1968, 12 years after they first met backstage at the Grand Ole Opry , Cash proposed to June Carter, an established country singer, during a live performance in London, Ontario , marrying on March 1, 1968 in Franklin, Kentucky . He had proposed numerous times, but she had always refused. They had one child together, John Carter Cash (born March 3, 1970). They continued to work together and tour for thirty-five years, until June Carter died in 2003. Cash died just four months after. Carter co-wrote one of his biggest hits, "Ring of Fire," and they won two Grammy awards for their duets. Vivian Liberto claims a different version of the origins of "Ring of Fire" in I Walked the Line: My Life with Johnny, stating that Cash gave Carter the credit for monetary reasons. In 1954, Cash and Vivian moved to Memphis, Tennessee , where he sold appliances while studying to be a radio announcer. At night he played with guitarist Luther Perkins and bassist Marshall Grant. Perkins and Grant were known as the Tennessee Two. Cash worked up the courage to visit the Sun Records studio, hoping to get a recording contract. After auditioning for Sam Phillips, singing mostly gospel songs, Phillips told him that gospel was unmarketable. It was once rumored that Phillips told Cash to "go home and sin, then come back with a song I can sell," though Cash refuted that Phillips made any such comment in a 2002 interview. Cash eventually won over the producer with new songs delivered in his early frenetic style. His first recordings at Sun, "Hey Porter" and "Cry Cry Cry", were released in 1955 and met with reasonable success on the country hit parade. Cash's next record, "Folsom Prison Blues", made the country Top 5, and "I Walk the Line" became No. 1 on the country charts and entered the pop charts Top 20. Following "I Walk the Line" was "Home of the Blues", recorded in July 1957. That same year Cash became the first Sun artist to release a long-playing album. Although he was Sun's most consistently best-selling and prolific artist at that time, Cash felt constrained by his contract with the small label. Elvis Presley had already left Sun, and Phillips was focusing most of his attention and promotion on Jerry Lee Lewis. The following year Cash left the label to sign a lucrative offer with Columbia Records, where his single "Don't Take Your Guns to Town" became one of his biggest hits. In the early 1960s, Cash toured with the Carter Family, which by this time regularly included Mother Maybelle's daughters, Anita, June and Helen. June, whom Cash would eventually marry, later recalled admiring him from afar during these tours. He also acted in a 1961 film entitled Five Minutes to Live, later re-released as Door-to-door Maniac. As his career was taking off in the early 1960s, Cash started drinking heavily and became addicted to amphetamines and barbiturates. For a brief time, he shared an apartment in Nashville with Waylon Jennings, who was heavily addicted to amphetamines. Cash used the uppers to stay awake during tours. Friends joked about his "nervousness" and erratic behavior, many ignoring the warning signs of his worsening drug addiction. In a behind-the-scenes look at The Johnny Cash Show, Cash claims to have "tried every drug there was to try." Although in many ways spiraling out of control, Cash's frenetic creativity was still delivering hits. His rendition of "Ring of Fire" was a crossover hit, reaching No. 1 on the country charts and entering the Top 20 on the pop charts. The song was written by June Carter and Merle Kilgore. The song was originally performed by Carter's sister, but the signature mariachi-style horn arrangement was provided by Cash, who said that it had come to him in a dream. In June 1965, his truck caught fire due to an overheated wheel bearing, triggering a forest fire that burned several hundred acres in Los Padres National Forest in California . When the judge asked Cash why he did it, Cash said, "I didn't do it, my truck did, and it's dead, so you can't question it." The fire destroyed , burning the foliage off three mountains and killing 49 of the refuge's 53 endangered condors. Cash was unrepentant: "I don't care about your damn yellow buzzards." The federal government sued him and was awarded $125,172 ($ in current dollar terms). Cash eventually settled the case and paid $82,001. Cash said he was the only person ever sued by the government for starting a forest fire. Although Cash carefully cultivated a romantic outlaw image, he never served a prison sentence. Despite landing in jail seven times for misdemeanors, each stay lasted only a single night. His most infamous run-in with the law occurred while on tour in 1965, when he was arrested by a narcotics squad in El Paso, Texas . The officers suspected that he was smuggling heroin from Mexico , but it was prescription narcotics and amphetamines that the singer had hidden inside his guitar case. Because they were prescription drugs rather than illegal narcotics, he received a suspended sentence. In the mid 1960s, Cash released a number of concept albums, including Ballads Of the True West (1965), an experimental double record mixing authentic frontier songs with Cash's spoken narration, and Bitter Tears (1964), with songs highlighting the plight of the Native Americans. His drug addiction was at its worst at this point, and his destructive behavior led to a divorce from his first wife and canceled performances. In 1967, Cash's duet with Carter, "Jackson", won a Grammy Award. Cash quit using drugs in 1968, after a spiritual epiphany in the Nickajack Cave , when he attempted to commit suicide while under the heavy influence of drugs. He descended deeper into the cave, trying to lose himself and "just die", when he passed out on the floor. He reported to be exhausted and feeling at the end of his rope when he felt God's presence in his heart and managed to struggle out of the cave (despite the exhaustion) by following a faint light and slight breeze. To him, it was his own rebirth. June, Maybelle, and Ezra Carter moved into Cash's mansion for a month to help him conquer his addiction. Cash proposed onstage to June at a concert at the London Gardens in London, Ontario , Canada on February 22, 1968; the couple married a week later (on March 1) in Franklin, Kentucky . June had agreed to marry Cash after he had 'cleaned up'. Rediscovering his Christian faith, taking an "altar call" in Evangel Temple, a small church in the Nashville area, pastored by Rev. Jimmy Rodgers Snow, son of country music legend Hank Snow. Cash chose this church over many larger celebrity churches in the Nashville area because he said that there he was treated like just another parishioner and not a celebrity. Cash felt great compassion for prisoners. He began performing concerts at various prisons starting in the late 1960s. These performances led to a pair of highly successful live albums, Johnny Cash at Folsom Prison (1968) and Johnny Cash at San Quentin (1969). The Folsom Prison record was introduced by a rendition of his classic "Folsom Prison Blues", while the San Quentin record included the crossover hit single "A Boy Named Sue", a Shel Silverstein-penned novelty song that reached No. 1 on the country charts and No. 2 on the U.S. Top Ten pop charts. The AM versions of the latter contained a couple of profanities which were edited out. The modern CD versions are unedited and uncensored and thus also longer than the original vinyl albums, though they still retain the audience reaction overdubs of the originals. In addition to his performances at U.S. prisons, Cash also performed at the Österåker Prison in Sweden in 1972. The live album På Österåker ("At Österåker") was released in 1973. Between the songs, Cash can be heard speaking Swedish, which was greatly appreciated by the inmates. From 1969 to 1971, Cash starred in his own television show, The Johnny Cash Show, on the ABC network. The Statler Brothers opened up for him in every episode; the Carter Family and rockabilly legend Carl Perkins were also part of the regular show entourage. However, Cash also enjoyed booking more contemporary performers as guests; such notables included Neil Young, Louis Armstrong, Kenny Rogers and The First Edition (who appeared a record four times on his show), James Taylor, Ray Charles, Eric Clapton (then leading Derek and the Dominos), and Bob Dylan. Cash had met with Dylan in the mid 1960s and became closer friends when they were neighbors in the late 1960s in Woodstock, New York . Cash was enthusiastic about reintroducing the reclusive Dylan to his audience. Cash sang a duet with Dylan on Dylan's country album Nashville Skyline and also wrote the album's Grammy-winning liner notes. Another artist who received a major career boost from The Johnny Cash Show was songwriter Kris Kristofferson, who was beginning to make a name for himself as a singer/songwriter. During a live performance of Kristofferson's "Sunday Mornin' Comin' Down", Cash refused to change the lyrics to suit network executives, singing the song with its references to marijuana intact: "On a Sunday morning sidewalk / I'm wishin', Lord, that I was stoned." By the early 1970s, he had crystallized his public image as "The Man in Black". He regularly performed dressed all in black, wearing a long black knee-length coat. This outfit stood in contrast to the costumes worn by most of the major country acts in his day: rhinestone suit and cowboy boots. In 1971, Cash wrote the song "Man in Black", to help explain his dress code: "We're doing mighty fine I do suppose/In our streak of lightning cars and fancy clothes/But just so we're reminded of the ones who are held back/Up front there ought to be a man in black." He and his band had initially worn black shirts because that was the only matching color they had among their various outfits. He wore other colors on stage early in his career, but he claimed to like wearing black both on and off stage. He stated that, political reasons aside, he simply liked black as his on-stage color. To this day, the United States Navy's winter blue service uniform is referred to by sailors as "Johnny Cashes," as the uniform's shirt, tie, and trousers are solid black. In the mid 1970s, Cash's popularity and number of hit songs began to decline, but his autobiography (the first of two), titled Man in Black, was published in 1975 and sold 1.3 million copies. A second, Cash: The Autobiography, appeared in 1997. His friendship with Billy Graham led to the production of a film about the life of Jesus, The Gospel Road, which Cash co-wrote and narrated. The decade saw his religious conviction deepening, and he made many evangelical appearances on Graham Crusade platforms around the world. He also continued to appear on television, hosting an annual Christmas special on CBS throughout the 1970s. Later television appearances included a role in an episode of Columbo. He also appeared with his wife on an episode of Little House on the Prairie entitled "The Collection" and gave a performance as John Brown in the 1985 American Civil War television mini-series North and South. He was friendly with every United States President starting with Richard Nixon. He was closest with Jimmy Carter, who became a very close friend. He stated that he found all of them personally charming, noting that this was probably essential to getting oneself elected. 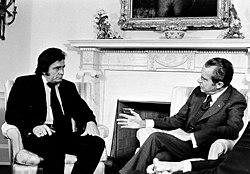 When invited to perform at the White House for the first time in 1972, President Richard Nixon's office requested that he play "Okie from Muskogee" (a satirical Merle Haggard song about people who despised youthful drug users and war protesters) and "Welfare Cadillac" (a Guy Drake song that derides the integrity of welfare recipients). Cash declined to play either song and instead played a series of more left-leaning, politically charged songs, including "The Ballad of Ira Hayes" (about a brave Native-American World War II veteran who was mistreated upon his return to Arizona ), and his own compositions, "What is Truth?" and "Man in Black". Cash claimed that the reasons for denying Nixon's song choices were not knowing them and having fairly short notice to rehearse them, rather than any political reason. In 1980, Cash became the Country Music Hall of Fame's youngest living inductee at age forty-eight, but during the 1980s his records failed to make a major impact on the country charts, although he continued to tour successfully. In the mid 1980s, he recorded and toured with Waylon Jennings, Willie Nelson, and Kris Kristofferson as The Highwaymen, making two hit albums. During this period, Cash appeared in a number of television films. In 1981, he starred in The Pride of Jesse Hallam, winning fine reviews for a film that called attention to adult illiteracy. In the same year, Cash appeared as a "very special guest star" in an episode of the Muppet Show. In 1983, he appeared as a heroic sheriff in Murder in Coweta County, based on a real-life Georgia murder case, which co-starred Andy Griffith as his nemesis. Cash had tried for years to make the film, for which he won acclaim. Cash relapsed into addiction after being administered painkillers for a serious abdominal injury in 1983 caused by an unusual incident in which he was kicked and wounded by an ostrich he kept on his farm. At a hospital visit in 1988, this time to watch over Waylon Jennings (who was recovering from a heart attack), Jennings suggested that Cash have himself checked into the hospital for his own heart condition. Doctors recommended preventive heart surgery, and Cash underwent double bypass surgery in the same hospital. Both recovered, although Cash refused to use any prescription painkillers, fearing a relapse into dependency. Cash later claimed that during his operation, he had what is called a "near death experience". He said he had visions of Heaven that were so beautiful that he was angry when he woke up alive. Cash's recording career and his general relationship with the Nashville establishment were at an all-time low in the 1980s. He realized that his record label of nearly 30 years, Columbia, was growing indifferent to him and wasn't properly marketing him (he was "invisible" during that time, as he said in his autobiography). Cash recorded an intentionally awful song to protest, a self-parody. "Chicken in Black" was about Cash's brain being transplanted into a chicken. Ironically, the song turned out to be a larger commercial success than any of his other recent material. Nevertheless, he was hoping to kill the relationship with the label before they did, and it was not long after "Chicken in Black" that Columbia and Cash parted ways. In 1986, Cash returned to Sun Studios in Memphis to team up with Roy Orbison, Jerry Lee Lewis, and Carl Perkins to create the album Class of '55. This was not the first time he had teamed up with Lewis and Perkins at Sun Studios. On December 4, 1956, Elvis Presley dropped in on Phillips to pay a social visit while Perkins was in the studio cutting new tracks, with Lewis backing him on piano. Cash was also in the studio and the four started an impromptu jam session. Phillips left the tapes running and the recordings, almost half of which were gospel songs, survived and have been released on CD under the title Million Dollar Quartet. Tracks also include Chuck Berry's "Brown Eyed Handsome Man", Pat Boone's "Don't Forbid Me", and Elvis doing an impersonation of Jackie Wilson (who was then with Billy Ward and the Dominoes) singing "Don't Be Cruel". In 1986, Cash published his only novel, Man in White, a book about Saul and his conversion to become the Apostle Paul. He also recorded Johnny Cash Reads The Complete New Testament in 1990. Johnny Cash sings a duet with a Navy lieutenant c.1987. After Columbia Records dropped Cash from his recording contract, he had a short and unsuccessful stint with Mercury Records from 1987 to 1991 (see Johnny Cash discography). In 1991, Cash sang lead vocals on a cover version of "Man in Black" for the Christian punk band One Bad Pig's album I Scream Sunday. His career was rejuvenated in the 1990s, leading to popularity among a younger audience not traditionally interested in country music. In 1993, he sang the vocal on U2's "The Wanderer" for their album Zooropa. Although he was no longer sought after by major labels, Cash was approached by producer Rick Rubin and offered a contract with Rubin's American Recordings label, better known for rap and hard rock. Under Rubin's supervision, he recorded the album American Recordings (1994) in his living room, accompanied only by his guitar. That guitar was a Martin dreadnought guitar - one of many Cash played throughout his career. The album featured several covers of contemporary artists selected by Rubin and had much critical and commercial success, winning a Grammy for Best Contemporary Folk Album. Cash wrote that his reception at the 1994 Glastonbury Festival was one of the highlights of his career. This was the beginning of a decade of music industry accolades and surprising commercial success. Cash and his wife appeared on a number of episodes of the popular television series Dr. Quinn, Medicine Woman starring Jane Seymour. The actress thought so highly of Cash that she later named one of her twin sons after him. He lent his voice for a cartoon cameo in an episode of The Simpsons, with his voice as that of a coyote that guides Homer on a spiritual quest. In 1996, Cash released a sequel to American Recordings, Unchained, and enlisted the accompaniment of Tom Petty and the Heartbreakers, which won a Grammy for Best Country Album. Cash, believing he did not explain enough of himself in his 1975 autobiography Man in Black, wrote another autobiography in 1997 entitled Cash: The Autobiography. In 1997, Cash was diagnosed with the neurodegenerative disease Shy-Drager syndrome. The diagnosis was later altered to autonomic neuropathy associated with diabetes. This illness forced Cash to curtail his touring. He was hospitalized in 1998 with severe pneumonia, which damaged his lungs. The albums American III: Solitary Man (2000) and American IV: The Man Comes Around (2002) contained Cash's response to his illness in the form of songs of a slightly more somber tone than the first two American albums. The video that was released for "Hurt", a cover of the song by Nine Inch Nails, fit Cash's view of his past and feelings of regret. The video for the song, from American IV, is now generally recognized as "his epitaph," and received particular critical and popular acclaim. Cash died less than four months after his wife, on September 12, 2003, while hospitalized at Baptist Hospital in Nashville. He was buried next to his wife in Hendersonville Memory Gardens near his home in Hendersonville, Tennessee . His stepdaughter, Rosie (Nix) Adams and another passenger were found dead on a bus in Montgomery County, Tennessee, on October 24, 2003. It was speculated that the deaths may have been caused by carbon monoxide from the lanterns in the bus. Adams was 45 when she died. She was buried in the Hendersonville Memory Gardens, Hendersonville, Tennessee, near her mother and stepfather. On May 24, 2005, Vivian Liberto, Cash's first wife and the mother of Rosanne Cash and three other daughters, died from surgery to remove lung cancer. It was Rosanne's fiftieth birthday. In June 2005, his lakeside home on Caudill Drive in Hendersonville was put up for sale by his estate. In January 2006, the house was sold to Bee Gees vocalist Barry Gibb and wife Linda and titled in their Florida limited liability company for $2.3 million. The listing agent was Cash's younger brother, Tommy Cash. The home was destroyed by fire on April 10, 2007. One of Cash's final collaborations with producer Rick Rubin, entitled American V: A Hundred Highways, was released posthumously on July 4, 2006. The album debuted in the #1 position on Billboard's Top 200 album chart for the week ending July 22, 2006. Enough of Cash's music was left to put together a posthumous album which he had helped plan. The album, American VI, was planned for release in 2009. From his early days as a pioneer of rockabilly and rock and roll in the 1950s, to his decades as an international representative of country music, to his resurgence to fame in the 1990s as a living legend and an alternative country icon, Cash influenced countless artists and left a large body of work. Upon his death, Cash was revered by the greatest popular musicians of his time. His rebellious image and often anti-authoritarian stance influenced the punk rock movement. Among Cash's children, his daughter Rosanne Cash (by first wife Vivian Liberto) and his son John Carter Cash (by June Carter Cash) are notable country-music musicians in their own right. Cash nurtured and defended artists on the fringes of what was acceptable in country music even while serving as the country music establishment's most visible symbol. At an all-star TNT concert in 1999, a diverse group of artists paid him tribute, including Bob Dylan, Chris Isaak, Wyclef Jean, Norah Jones, Kris Kristofferson, Willie Nelson, and U2. Cash himself appeared at the end and performed for the first time in more than a year. Two tribute albums were released shortly before his death; Kindred Spirits contains works from established artists, while Dressed in Black contains works from many lesser-known artists. In total, he wrote over a thousand songs and released dozens of albums. A box set titled Unearthed was issued posthumously. It included four CDs of unreleased material recorded with Rubin as well as a Best of Cash on American retrospective CD. In recognition of his lifelong support of SOS Children's Villages, his family invited friends and fans to donate to that charity in his memory. He had a personal link with the SOS village in Diessen , at the Ammersee Lake in Southern Germany , near where he was stationed as a GI, and also with the SOS village in Barrett Town, by Montego Bay , near his holiday home in Jamaica . The Johnny Cash Memorial Fund was founded. In 1999, Cash received the Grammy Lifetime Achievement Award. In 2004, Rolling Stone Magazine ranked Cash #31 on their list of the 100 Greatest Artists of All Time. In a tribute to Cash after his death, country music singer Gary Allan included the song "Nickajack Cave (Johnny Cash's Redemption)" on his 2005 album entitled Tough All Over. The song chronicles Cash hitting rock bottom and subsequently resurrecting his life and career. The main street in Hendersonville, Tennessee , Highway 31E, is known as "Johnny Cash Parkway". The Johnny Cash Museum is located in Hendersonville, Tennessee . On November 2–4, 2007, the Johnny Cash Flower Pickin' Festival was held in Starkville, Mississippi . Starkville, where Cash was arrested over 40 years earlier and held overnight at the city jail on May 11, 1965, inspired Cash to write the song "Starkville City Jail". The festival, where he was offered a symbolic posthumous pardon, honored Cash's life and music, and was expected to become an annual event. In 1998, country singer Mark Collie portrayed Cash for the first time in a short film, I Still Miss Someone. Shot mostly in black and white, it attempts to capture a moment in time for Cash during his darkest years, the mid 1960s. Walk the Line, an Academy Award-winning biopic about Cash's life starring Joaquin Phoenix as Johnny and Reese Witherspoon as June (for which she won the 2005 Best Actress Oscar), was released in the United States on November 18, 2005 to considerable commercial success and critical acclaim. Both Phoenix and Witherspoon have won various other awards for their roles, including the Golden Globe for Best Actor in a Musical or Comedy and Best Actress in a Musical or Comedy, respectively. They both performed their own vocals in the film, and Phoenix learned to play guitar for his role as Cash. Phoenix received the Grammy Award for his contributions to the soundtrack. John Carter Cash, the only child of both Johnny and June, was an executive producer on the film. Ring of Fire, a jukebox musical of the Cash oeuvre, debuted on Broadway on March 12, 2006 at the Ethel Barrymore Theatre , but closed due to harsh reviews and disappointing sales on April 30, 2006. See Johnny Cash discography, and Johnny Cash Sun Records discography. For detailed lists of music awards, see List of Johnny Cash awards. Cash received multiple Country Music Association Awards, Grammys, and other awards, in categories ranging from vocal and spoken performances to album notes and videos. In a career that spanned almost five decades, Cash was the personification of country music to many people around the world. Cash was a musician who was not tied to a single genre. He recorded songs that could be considered rock and roll, blues, rockabilly, folk, and gospel, and exerted an influence on each of those genres. Moreover, he had the unique distinction among country artists of having "crossed over" late in his career to become popular with an unexpected audience, young indie and alternative rock fans. His diversity was evidenced by his presence in three major music halls of fame: the Nashville Songwriters Hall of Fame (1977), the Country Music Hall of Fame (1980), and the Rock and Roll Hall of Fame (1992). Only thirteen performers are in both of the last two, and only Hank Williams Sr., Jimmie Rodgers, and Bill Monroe share the honor with Cash of being in all three. However, only Cash was inducted into the Rock and Roll Hall of Fame in the regular manner, unlike the other country members, who were inducted as "early influences." His pioneering contribution to the genre has also been recognized by the Rockabilly Hall of Fame. He received the Kennedy Center Honors in 1996. Cash stated that his induction into the Country Music Hall of Fame, in 1980, was his greatest professional achievement. He was nominated for best cinematography for "Hurt" and was supposed to appear, but died during the night. In 2007, Cash was inducted into the Hit Parade Hall of Fame. Millier, Bill. (retrieved September 7, 2004). Johnny Cash Awards. JohnnyCash.com. Streissguth, Michael. Johnny Cash at Folsom Prison: The Making of a Masterpiece, Da Capo Press (2004). ISBN 0-306-81338-6. Urbanski, Dave. The Man Comes Around: The Spiritual Journey of Johnny Cash. New York: Relevant Books. ISBN 0-9729276-7-0. Cash, Johnny. Man in Black: His Own Story in His Own Words. Grand Rapids: Zondervan, 1975. ISBN 99924-31-58-X. Cash, Johnny, with Patrick Carr. Cash: The Autobiography. New York: Harper Collins, 1997. ISBN 0-06-101357-9. Cash, Johnny, with June Carter Cash. Love liner notes. New York: Sony, 2000. ASIN B00004TB8A. Turner, Steve. The Man Called Cash: The Life, Love, and Faith of an American Legend. Nashville, Thomas Nelson, 2004. (The Authorized Biography). Cash, Johnny, "The Man in White," 1986, a fictionalized account of the life of the Apostle Paul.